Earn 189 - 329 points upon purchasing this product. 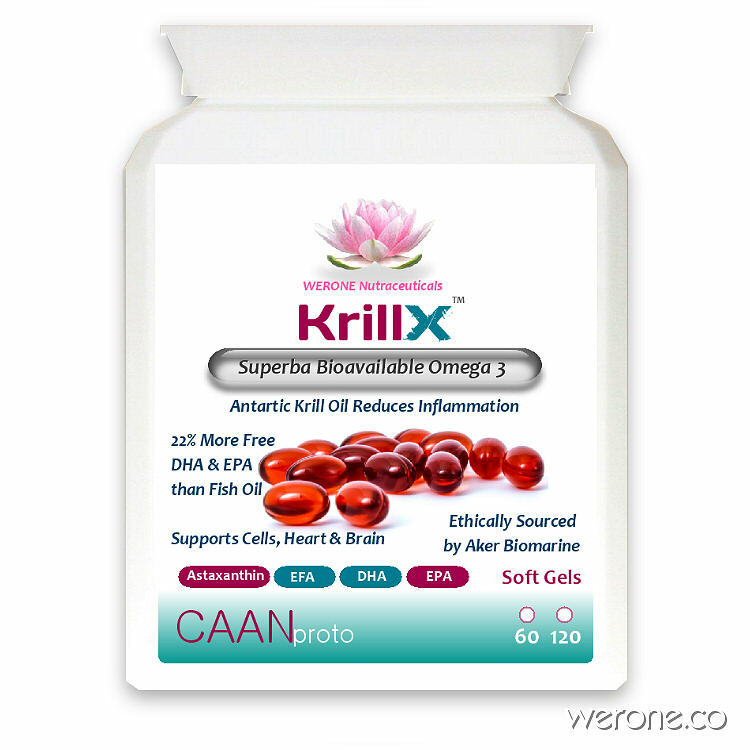 KrillX Krill Oil Capsules contain pure Antarctic Krill from SUPERBA that is proven to be a superior source of Omega 3 (EPA & DHA) and antioxidant Astaxanthin and ethically sourced by Aker Biomarine. Omega 3 is essential for human health, most people in UK at 4% serum blood level are actually deficient and at high risk of heart disease, the safe levels being 12% (Omega3 Index Project). Use 1890 - 3290 points to purchase this product! The Omega 3 fatty acids; EPA and DHA are necessary for proper functioning, particularly in your brain. DHA plays a very important role in your nervous system functioning, provides anti-inflammatory benefits, and is also associated with improved mood, insulin sensitivity, muscle growth, and better sleep, Omega 3 is also synergistic with Melatonin & Curcumin (see below). Omega 3 in Krill Oil is bound to phospholipids which present better bioavailability of EPA, DHA for cells and tissues in humans. Studies have clearly demonstrated that increase in level of omega 3 is accompanied by health-promoting benefits. It is clearly emerging that dietary phospholipid-bound EPA and DHA affect endocannabinoid biosynthesis at much lower doses than EPA and DHA in tryglyceride form such as fish oil, probably because of the higher incorporation into tissue phospholipids , and positively modify several parameters of the metabolic syndrome [source]. “A low Omega-3 Index correlates with a higher risk of cardiac death, while a high O3i is ideal for maintaining a healthy heart,” explains Dr. Bill Harris, an internationally recognized omega-3 expert and co-inventor of the Omega-3 Index Test. “Unfortunately, most people globally have a low or very low Omega-3 Index, which significantly increases their risk of cardiac death.” see map of Worldwide distribution of Omega 3 to populations. Krill has been shown to regulate blood lipids to healthy levels by reducing total cholesterol, LDL, triglycerides and increasing levels of HDL. Krill Oil Omega 3 is also beneficial for healthier joints and helps improve brain functions. In the next video, Dr. Rhonda Patrick discusses the differences between krill oil and fish oil in terms of bioavailability and transport into different cells. She explains how DHA and EPA from fish oil in ethyl ester form (molecularly distilled) is the least bioavailable due. She also explains why omega-3 fatty acids in phospholipid from from krill oil are more bioavailable than EPA and DHA in triglyceride form from fish oil. For a better understanding of how omega-3 works in the cell, watch this video. Dr Patrick also talks here about the differences in transport of DHA into the brain and why krill oil has a type of DHA (DHA in phosphatidylcholine) that is more readily transported into the brain because it forms DHA-lysophsophatidylcholine. She explains about astaxanthin, a carotenoid that is unique to krill oil, and has potent antioxidant activity and prevents the oxidation of DHA and EPA within the body. Omega 3 decreases the proliferation of tumour cells, whereas arachidonic acid, a long chain n-6 fatty acid, increases their proliferation. These opposite effects are also seen with inflammation, particularly with rheumatoid arthritis and with asthma. Curcumin is a principal component of the spice turmeric, and complements the action of DHA in the brain beautifully. – curcumin increases DHA in the brain and liver. – Dietary curcumin and ALA reduces anxiety-like behaviour. 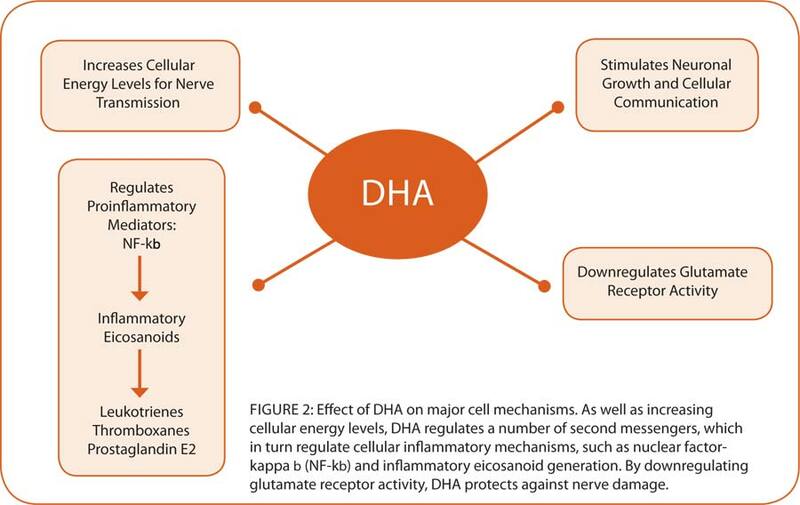 – DHA downregulates Glutamate which can be used as fuel for cancer growth. Besides protecting omega-3 molecules, melatonin also increases the levels of EPA omega-3 in the brain, improving the omega-6 to omega-3 ratio (source). EPA omega-3’s anti-inflammatory benefits are well known. Scientists have particularly noted the benefits of EPA for specific cell types that are involved in aging and reducing neuroinflammation. Omega-3 molecules also appear to return the favor by helping keep up the body’s production of melatonin. Omega-3 fatty acids make up a part of the pineal gland, which is one of the structures in the body that produces melatonin. It is believed that the pineal gland might be synergistically regulated by the omega-3 molecules (source). Antarctic Krill is the largest biomass on the planet measuring more than 500 million metric tons. It maintains because it reproduces successfully while it is strictly monitored by the CCAMLR. Krill oil reduces plasma triacylglycerol level and improves related lipoprotein particle concentration, fatty acid composition and redox status in healthy young adults – a pilot study. Incorporation of EPA and DHA into plasma phospholipids in response to different omega-3 fatty acid formulations—a comparative bioavailability study of fish oil vs. krill oil. Lipids in Health and Disease. DHA synthesis is increased by curcumin, via an FASD2 dependent pathway.